They all have an item number and a name, some have colour and size some are missing these properties. In the price column are the prices where you use special coding where NP = No price, and POR = price on request. 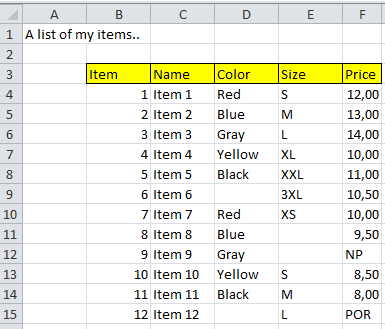 This kind of table is very easy to import into MS Access as a table. 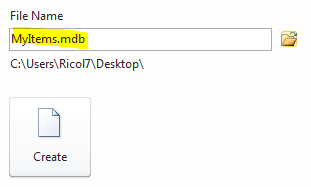 First create a new database, use 2003 format and mdb. If you don’t must use the 2007-format, and in all cases you don’t need it – my advice is skip it. 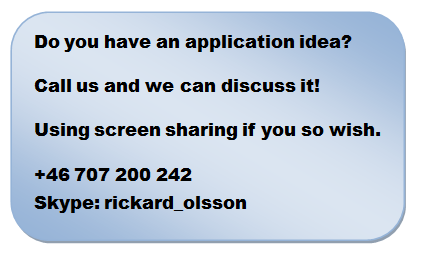 MS has put in some annoying restrictions, so avoid “.accdb”. 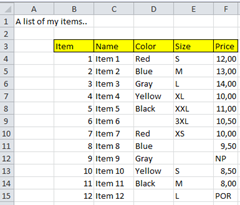 Select “External Data” and the Excel option and click the “Browse”-button to show where your Excel sheet is located. 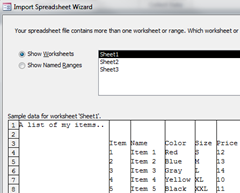 You are now running a wizard that guides you thru the process of importing your spread sheet into a database table. You will get one of these silly warnings “A potential security..” , but click “Open”. You open the table in MS Access, and you get what you asked for but not what you expected. 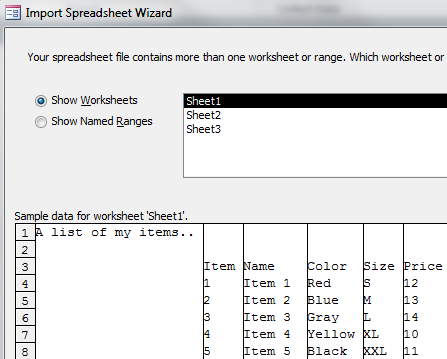 As an Excel user you don’t understand nothing. Reading more about the import tool in Access.